"From the beginning, Christianity has understood itself as the religion of the 'Logos', as the religion according to reason. In the first place, it has not identified its precursors in the other religions, but in the philosophical enlightenment which has cleared the path of tradition to turn to the search of the truth and towards the good, toward the one God who is above all gods." — Joseph Cardinal Ratzinger, "The Subiaco Address"
The reading of what is billed as a "theology" book on a pope, of all things, will not seem to be what this book surely is to read, namely, a distinct pleasure. Aristotle warned us that if we do not take proper delight in all things, especially in the things of the mind, we will not know the highest pleasures that are in store for us when we seek to use that given faculty we call intellect. Well, that is not an exact citation from Aristotle, but pretty close. Clearly the highest pleasures follow from our knowing the highest truths and the reality in which they are founded. The central point of this book is this: "What is the Christian understanding of God?" And what is the relation of the God of Abraham, Isaac, and Jacob to the God of the Philosophers? No doubt our best current guide to the answer to these fundamental questions lies in the work and pontificate of Benedict XVI. This slim volume by Tracey Rowland is introduced by George Cardinal Pell. He remarks, "It is a sign of the times and a portent of the future that this excellent volume was written by a young, married woman" well on her way to "becoming Australia's leading theologian" (x). Tracey Rowland is from the Brisbane area, currently the head of the John Paul Institute in Melbourne, where her husband Stuart is a lawyer. She earned a Master's Degree in political philosophy at the University of Melbourne and her doctorate at Cambridge University in England. For Ratzinger, the whole point of Gaudium et Spes, correctly interpreted, is that a 'daring new' Christocentric theological anthropology is the medicine that the world needs, and that it is the responsibility of the Church to administer of it. He is critical of interpretations which would transform Christianity into what he provocatively calls a 'poorly managed haberdashery that is always trying to lure more customers'" (46). This means that the understanding of man begins with the understanding of God, creation, the Fall, the Incarnation, and redemption. If we begin here, we will understand our minds better, while leaving them at the same time precisely minds. As I have known Tracey Rowland for many years as a good friend and have also known her work, I would not restrict the scope of her theological excellence and influence to Australia. Her association with the Cambridge "Radical Theology" school already has put her in contact with some of the most insightful figures in today's theological world, with John Milbank, Catherine Pickstock, Fergus Kerr O. P., and Aidan Nichols O. P. Thus, the following remarks are by no means a "review" or "critique" of Rowland's work. Let's just call them, as was the case of my comments on Msgr. Robert Sokolowski's Christian Faith & Human Understanding (Ignatius Insight, March 2006), Schall's "appreciation" of a friend's remarkably insightful book. Yes, I find here a distinct delight that comes from reading something that is both well done, true, and indeed written, as all theology should be, with considerable wit. Let me cite just one example of the latter: "When it comes to the question of whether or not the practice of kneeling should be abolished (as advanced liturgists oddly seem to insist is the will the Almighty), he (Benedict) has no time at all for the ideas of the anti-kneeling contingent" (138). In fact, the Pope's analysis of the history of kneeling (Benedict seems to know the history of about everything) shows that it is a distinctly Christian invention, not at all common to other religions. Its practice was based on a specifically Christian theological idea of the relation of man to God not at all inimical to either of the two parties. The only "quibble" that I have with this book is over the title. This issue is succinctly expressed in the title I have given to these reflections, not Ratzinger's Faith, as is in fact the book's title, but "Ratzinger's Faith and Reason." This is why I cited the passage about the Logos from Ratzinger's Subiaco Lecture, a passage that can be duplicated in the Regensburg Lecture (also an Appendix of this book) and many other sources in the immense corpus of this present pope's writings. If we just call something "Schall's Faith" or "Rowland's Faith," or even "Ratzinger's Faith," we will be tempted to say: "Well, fine, so that is what that fool Schall holds. So what? I hold something entirely different! On this approach, everyone's 'faith' is equal no matter what it is." The whole spirit of Ratzinger's work, of course, is that such relativism cannot be defended in reason and certainly not in revelation. Now I do not at all imply that Tracey Rowland would not agree with my point here if she knew it. Knowing the ways of book editors and publishers, I am not even sure this was her original title. Why this pope is particularly important is precisely his insistence that the faith is addressed to and indeed advances and heals reason. That connection is what this book is about in its most important reaches. No one is clearer on this point than Tracey Rowland herself. "The emphasis given by Benedict to 'an intellectual affirmation' by which one understands the beauty and the organic structure of faith means that the primary task of the Church in this era is one of catechesis and healing rather than accommodation and assimilation" (147). Notice that the "beauty" and "organic structure" of the faith are what calls for an "intellectual affirmation." This passage is not only quite amusing—imagine a "facile" Ratzinger "replaying" Augustine over till the Second Coming—but brings up the question of where Ratzinzer stands with regard to medieval, baroque, modern, and post-modern thought. Actually, I can imagine the pianist, Josef Ratzinger, playing Mozart over and over on the piano till the Second Coming and beyond. What he says on beauty, as the introductory citation implies, comes pretty close to suggesting, as does Plato, that the singing and sacrificing and dancing may very well what we do in eternity. We should not underestimate such a passage. It portends that, in this pope, we have a man who is wise in all fields. Christianity in its Catholic grounding is a coherent whole that first needs to know what its own internal order is fundamentally about. Then, in knowing this order, it can examine what the other claims to truth are and the evidence for them. This book of Tracey Rowland, I think, in the briefest way possible, gives the dimensions of this coherence and the initiatives to make it known and practiced that we find in Josef Ratzinger. "From Benedict's perspective the suicide of the West began when people stopped believing in the Christian account of creation and started to sever the intrinsic relationship of faith and reason." (122) This is a passage worthy of Nietzsche, whose famous death of God was not so much the result of a metaphysical analysis of being as a horrible personal realization that Christians themselves evidently did not much believe in the faith they professed. Nietzsche was a prophet of post-modern irrationalism and the decline of a Europe that had lost its original faith. Ratzinger often cites Nietzsche. "Being prepared for heroic self-sacrifice for the good of another is the very essence of chivalry and the very antithesis of the morality of Nietzsche's superman or the feminist superwoman." (72) The superman projects his will to power in a world of void that has lost its coherence. The very opposite of this view is that of a world made in gift that arises out of the abundance of the love within the Trinitarian Godhead itself. It is a commonplace that behind political institutions is always a worldview, an ideology. Here the notion of "self-redemption" is seen precisely as an alternative to that faith that originated Europe. It is ironically called a "utopia" that has led to a "regression without precedent." Rowland points out that the Christian understanding of reason is not simply a return to pagan reason. "'In the Greek conception, the world appears as a divine fullness at peace within itself. While for the Christian account of creation, the world is dependent on something other than itself,' Ratzinger concludes that this is the aesthetic prelude to an increasingly prominent idea in the modern mind: the idea that the human dependency implied by faith in creation is unacceptable." (108) What Benedict has set out to show, especially in his first two encyclicals Deus Caritas Est and Spe Salvi, is that what is unacceptable is precisely a denial of this dependence, the logical consequence of which is not "slavery" but the freedom to receive the gift of divine life which is the only real destiny worth having. This book consists of seven chapters and an Introduction. The first chapter is on the place of Ratzinger in theological scholarship. The second deals with culture and Gaudium et Spes. Chapter Three is on Scripture, Chapter Four on Moralism and Love, Chapter Five is on the Church, Chapter Six is on Modernity and Politics, and Chapter Seven is on the Liturgy. Rowland succinctly explains the position Benedict has taken on all of these issues. One astonishing thing about Ratzinger is that he does take positions. And he seems to have thought about most everything. Recently, I had given a number of talks on Spe Salvi. A couple of weeks ago, someone gave me a copy of the Catholic University Press translation of Ratzinger's Eschatology, a book originally written in German in 1977. Of course, we discover that the pope has been thinking of death, hell, eternal life, and purgatory for decades. One senses the finger of God here in bringing forth this material that would otherwise have been known only to a few had not Ratzinger become Benedict. The most serious concern of this book is to place Ratzinger as a thinker and doer who has managed to confront almost every major theological issue and to keep in clear focus how the central teachings of the Church are to be understood and presented as the most brilliant explanations of man in the cosmos. No doubt the chapter that will cause the most immediate stir is that concerning the liturgy. The pope's book The Spirit of the Liturgy, a title he used in honor of a similar title of Romano Guardini a half century previously, has been a refreshing representation of the centrality of the Mass, its meaning, the way to celebrate, attend, and worship at it. That there have been many aberrations in this area since Vatican II, no one will deny. What to do about them is a work in progress. Christianity is, above all, about the proper way to worship God. This way, when we think about it, could ultimately only come to us from God Himself. The relation of Christ, the Word, to the Eucharist, the redemptive sacrifice, and thereby to the Father is something that Benedict is at pains to clarify. Benedict's "general assessment is that the reforms of the liturgy in parts of the Church have been 'culturally impoverishing' and that the 'great cosmic dynamism of the liturgy has grown short of breath....' Some contemporary liturgies he believes are even forms of apostasy..." (129) If anything, Benedict seeks to restore dignity and mystery and, especially, beauty, of music and architecture. "With reference to the experience of Peter, James, and John of the Transfiguration, he argues that beauty is 'not mere decoration' but an essential element of liturgical action." (131) Beauty is, indeed, one of the effects of revelation itself. To those Catholics who have longed for a dignified and inspiring liturgy, Roland writes: "Rather than being ecclesial lepers, in the pontificate of Benedict XVI Catholics who have for several decades suffered behind an iron curtain of parish tea party liturgies and banal 'cuddle me Jesus' pop songs, liturgy as psychotherapy and a group bonding exercise, are more likely to be welcomed in from the cold and treated like ecclesial treasures." (141) Many will also applaud the following passage Rowland cites from Ratzinger: "Wherever applause breaks out in the liturgy because of some human achievement, it is a sure sign that the essence of the liturgy as totally disappeared and been replaced by a kind of religious entertainment." (138) The choir itself is "supposed to have been praising god, not putting on a concert." How much air such a passage clears is difficult to estimate, but one would guess an awful lot. This book, in any case, possesses a concise thoroughness that finds what Ratzinger said in some obscure German journal forty years ago. It puts back together things that have been scattered in Christian thought itself. That we have suffered from liturgical, theological, scriptural, and cultural confusion there can be no doubt. What we have in Benedict, as Rowland shows us, is a kind of quiet intellectual energy that has long penetrated to the core of the most important of theological and philosophical controversies. Benedict's is a mind that does understand what Plato and Aristotle, Augustine and Bonaventure and Aquinas said, what Suarez wrote, what Luther was about. He knows French thought along with Kant and the Enlightenment. He is familiar with Hegel, Marx, and Nietzsche, as well as Habermas and the modern German scholars and philosophers. His "proof" that the resurrection is at least intellectually feasible in Spe Salvi does not come from Paul or Aquinas but from the Marxist thinker Theodore Adorn and the meaning of justice as foreshadowed in Plato. Ratzinger is aware that the grounds on which modernity has based itself no longer hold much credibility. One finishes this book with a sense of comfort. The "Logos" has left the secular realm. Its primary defenders sit on the throne of Peter and deal with the sensible people who still read Plato and Aristotle, Augustine, Aquinas, and Bonaventure. Or perhaps we should say that what Rowland has shown us is how this pope sees a complete reordering of the priorities of reason and revelation. Ratzinger is in no sense an enemy of reason, though he knows when it is used erroneously. Revelation does make sense, but it needs to be seen first as grounded in the scripture and tradition from whence our understanding of the Godhead first was formulated with the aid of the Macedonia to which Paul was sent. This pope does seek to meet any religious or philosophical or scientific position on the grounds of reason. It is no longer enough politely to "disagree." Though we are to be properly tolerant, no one can any longer hide under the pretence of "private opinion" left unexamined. The "unexamined life" that Socrates thought was not worth living now includes the proper examination of a revelation addressed to Logos, to reason. As Benedict remarked in his Regensburg Address and is repeated here (161), the de facto but illogical "self-limitation" of reason to only its rationalistic or technical side deprives our minds of their full scope. It leaves the Western mind devoid of those spiritual resources that are most looked for in the cultures of Islam and the East. "Western culture is fractured since each of its institutions, from the family up to parliaments, universities, and courts, are operating on concepts and values which are unstable and at varying states in the process of 'multifaceted mutation. There is not even one single telos to which the mutations are heading." (143) These are sober, ominous words. This book is literally what its sub-title says it is, "the theology of Pope Benedict XVI." We will not find, I suspect, a clearer or briefer or more accurate presentation of this theology. "Ratzinger stresses that Christians cannot prescind from the explicit theism of the first tablet of the Ten Commandments which begins: 'I am the Lord your God, you shall not have other gods before Me.' Christians 'cannot yield on this point; without God, all the rest would no longer have any logical coherence." (70) The papacy of Benedict, as Tracey Rowland recounts it so well, is nothing less than a careful reminder and explanation to us of just that in which this "logical coherence" consists. Tracey Rowland, Ratzinger's Faith: The Theology of Pope Benedict XVI (Oxford: University Press, 2008), 140-41. Joseph Cardinal Ratzinger, "The Subiaco Address" (April 1, 2005), Appendix I of Ratzinger's Faith, ibid., 163. 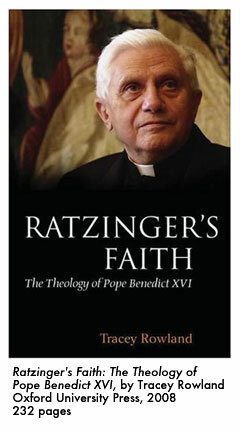  The Theological Genius of Joseph Ratzinger | An Interview with Fr. D. Vincent Twomey, S.V.D.  The Courage To Be Imperfect | The Introduction to Pope Benedict XVI: The Conscience of Our Age (A Theological Portrait) | D. Vincent Twomey, S.V.D. He is the author of numerous books on social issues, spirituality, culture, and literature including Another Sort of Learning, Idylls and Rambles, A Student's Guide to Liberal Learning, The Life of the Mind (ISI, 2006), The Sum Total of Human Happiness (St. Augustine's Press, 2007), and The Regensburg Lecture. 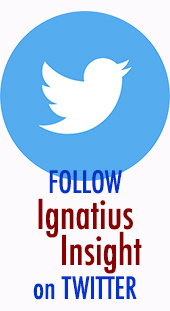 His most recent book is The Order of Things (Ignatius Press, 2007). Read more of his essays on his website.